RRP: $33.95 - available in 6 shades. Specifically created for women who are seeking subtle radiance and luminosity that gets their healthy-looking skin and not their foundation noticed – this innovative product delivers beautiful coverage with the added benefit of enhanced skincare properties. Max Factor Skin Luminizer Foundation contains an innovative swirled formula packed with subtle skin luminizers that deliver a beautiful luminous finish with added skincare benefits. The pearl pigments brighten skin tone for instant radiance while elastomers create “windows” in the skin through which light can be reflected back, creating a luminous and wide-awake effect. One of my new favourite foundations, well actually I would probably go as far as to say it is the best foundation I have come across this year! 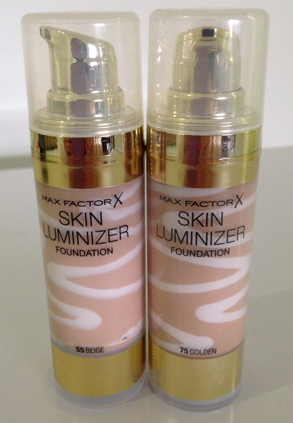 Max Factor have just realised a newbie under their name with releasing Max Factor Skin Luminizer Foundation. For me being a Mumma shortcuts are my thang and I like to be able to make my face routine as quick as possible so I can rush out the door which seems to be the normal these days. My problem is that I tend to find my foundations will not stay all day and this would be because of my skin type issues but Max Factor just stuck to my face like glue and wouldn't allow my 'real no makeup red nose' to pop through. I was left with all day coverage that would do exactly what the point of foundation is meant to be for. 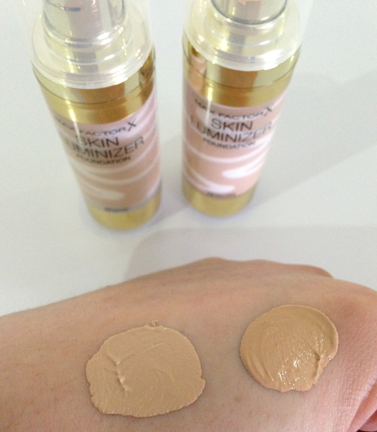 Max Factor Skin Luminizer Foundation comes in a push top bottle for easy application. The 'swirl' part that you can see within the bottle is the luminizer that will give you that luminious finish. The foundation itself is very light on the skin but don't let that fool you as it's easily build able for more coverage - I use more on that areas that I don't normally brighten up. Max Factor Skin Luminizer Foundation has added Vitamin B & E as well as added glycerine which will moisturise our skin and help to hydrate it. I did find that the finish of the foundation was a bit dewy/creamy and sticky though so I used some finishing/setting powder lightly on top just to soak that up and give it a flawless finish. For me the Max Factor Skin Luminizer Foundation was best applied via your finger or a sponge blender as the brushes didn't seem to apply well with this foundation. I loved the glow I was left with and leaving my skin with a luminous finish. It complimented the areas I would normally brighten well. At the moment I sit well with the shade Beige 55 but when it comes tanning time I would definitely be a Golden 75, bring on Summer!! Natural 50, Bronze 80, Beige 55, Golden 75, Warm Almond 45 and Light Ivory 40.